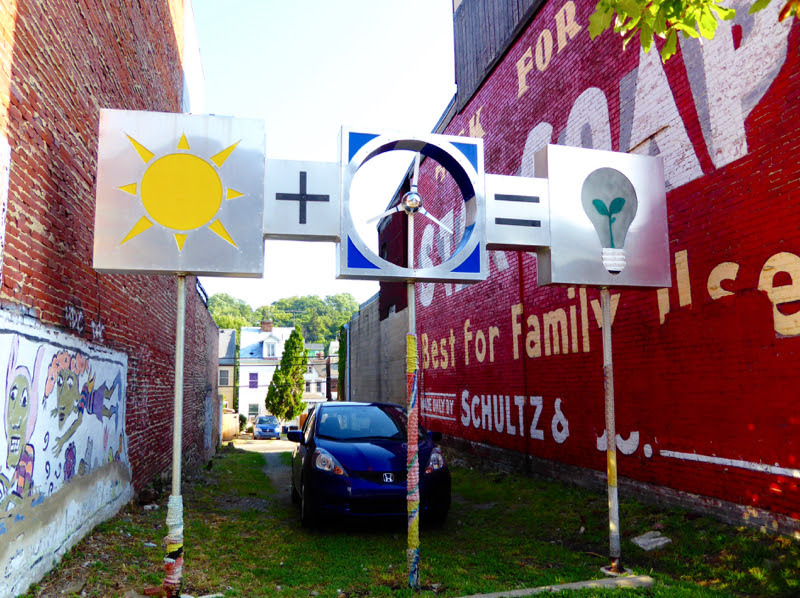 A resource for finding and enjoying outdoor murals and public art in the Pittsburgh area. A community group, the Bloomfield–Garfield Corporation, teamed up with ecoDesigners Guild on their Green+Screen project. The goal is to make improvements to empty lots and eyesores in the community. Some projects are designed to screen the clutter or run–down area from view. Other projects work to make physical improvements through landscaping efforts. This is one of the two current art projects built to enhance the space, but made so that they can be relocated if the lot is later developed. This is the other one. The green in the Green+Screen is for the use of recycled materials and plants. In this particular project, it’s also about generating it’s own power through solar and wind energy. The energy it creates is used to light the sculpture at night (with LEDs of course – since this is a green project!). The lead artist on this sculpture is David Lee Edwards, and on the website for his Art Energy Design he states that In the public arts I never forget that the composition is indeed for the public and that all themes represented must serve well the landscape in which they reside. How apparent that is when you compare this piece with the mural that he did on the Northside (East Allegheny neighborhood) for Deutschtown. Completely different styles and mediums for completely different neighborhoods and messages.